The rapid and robust immunoregulatory cytokine response of Va14Ja18 natural T (iNKT) cells to glycolipid Ags determines their diverse functions. Unlike conventional T cells, iNKT lymphocyte ontogeny absolutely requires NF-κB signaling. However, the precise role of NF-κB in iNKT cell function and the identity of upstream signals that activate NF-κB in this T cell subset remain unknown. Using mice in which iNKT cell ontogeny has been rescued despite inhibition of NF-κB signaling, we demonstrate that iNKT cell function requires NF-κB in a lymphocyte-intrinsic manner. Furthermore, the ontogeny of functional iNKT cells requires signaling through protein kinase Cθ, which is dispensable for conventional T lymphocyte development. 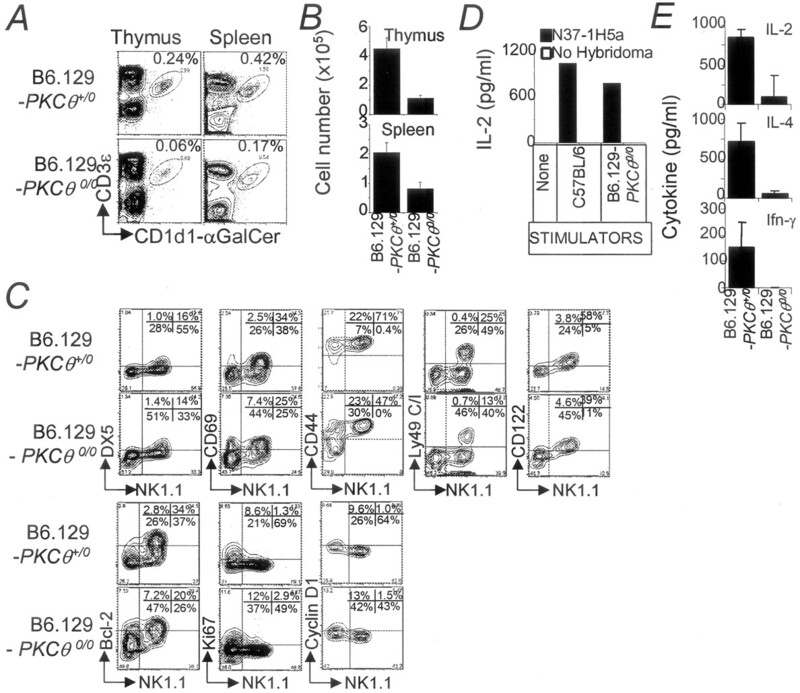 The unique requirement of protein kinase Cθ implies that signals emanating from the TCR activate NF-κB during iNKT cell development and function. Thus, we conclude that NF-κB signaling plays a crucial role at distinct levels of iNKT cell biology. The immunoregulatory natural T (iNKT)3 cells express an invariant Va14Ja18 TCR α-chain predominantly paired with the Vb8.2 TCR β-chain. They recognize lipid Ags such as the potent antitumor agent α-galactosylceramide (αGalCer) presented by CD1d. In vivo iNKT cell activation results in a rapid and robust secretion of both Th1- and Th2-type cytokines. These cytokines trans-activate other immune components, and hence iNKT cell response in vivo impacts both the innate and adaptive immune systems (reviewed in Ref. 1). Because instructional processes largely determine the effector properties of lymphocytes during their development, we reasoned that unique molecular controls regulate the development of functional iNKT cells. Consistent with this prediction, we (2) and others (3, 4) reported recently that iNKT cells, in striking contrast to conventional T lymphocytes, require finely tuned NF-κB signaling for the early steps of iNKT cell development. The requirement for NF-κB1, a classical NF-κB subunit, in iNKT cell ontogeny is cell intrinsic (4), whereas the requirement for RelB, another NF-κB subunit, is cell extrinsic (3, 4). Furthermore, we found that NF-κB regulates iNKT cell ontogeny by suppressing apoptosis (2) and not proliferation (4), a conclusion supported by the fact that T lineage-specific Bcl-xL expression in NF-κB-deficient thymocytes completely rescues iNKT cell development and differentiation (2). These findings raise two important questions regarding iNKT cell ontogeny: 1) does NF-κB control iNKT cell function, and 2) which upstream signaling molecule(s) activate NF-κB in iNKT cells? In this study, we present evidence that the ontogeny of functional iNKT cells requires signals emanating from the TCR, which are relayed through protein kinase C (PKC)θ and processed by NF-κB. C57BL/6 and B6.129-NF-κB10/0 (NF-κB10/0) mice were purchased from The Jackson Laboratory (Bar Harbor, ME). B6.129-CD1d10/0 (5), B6-ΔNtg, and C-ΔNtg (6) mice have been described; B6.129-PKCθ0/0 (7) strain was a generous gift from D. Littman (Howard Hughes Medical Institute, New York University, New York, NY). C-ΔNtg mice were bred to C-Lck-Bcl-xLtg mice, which constitutively express Bcl-xL in T lineage cells (8). All mice were bred and maintained in compliance with Vanderbilt University’s Institutional Animal Care and Use Committee regulations. Abs and reagents for ELISA, and cell surface and intracellular staining were purchased from BD PharMingen (San Diego, CA) (for details, see Ref. 2), unless stated otherwise. αGalCer was generously provided by Kirin Brewery Company (Gunma, Japan). Preparation of CD1d1-αGalCer (CD1) tetramer, and its specificity and use have been described (9). The N37-1H5a iNKT hybridoma was maintained as described (10). Approximately 5 × 104 hybridoma cells per well were mixed with 5 × 105 stimulator thymocytes and cocultured in triplicate for 18–20 h at 37°C. IL-2 secreted upon activation of the hybridoma was monitored by ELISA (9). Each mouse was injected i.p. with 10 μg of αGalCer diluted in PBS from a 200 μg/ml stock solution in vehicle (0.05% v/v polysorbate-20 and 0.9% w/v NaCl) or vehicle. Four hours later, sera were collected, and IL-2, IL-4, and IFN-γ were measured by ELISA (9). C57BL/6 splenocytes were dispersed by collagenase D (Roche Diagnostic, Somerville, NJ) treatment, washed, reacted with anti-CD11c-coated magnetic beads (Miltenyi Biotec, Auburn, CA) and separated using auto-MACS sorter (Miltenyi Biotec). Sorted DC were pulsed with αGalCer (1 μg/ml) for 6 h. Splenocytes from mice indicated in the figure were reacted with anti-MHC class II coated magnetic beads (Miltenyi Biotec), and the unbound T cell-enriched fraction was purified. After extensive washes with PBS, 1 × 105 αGalCer-pulsed DC were cocultured with 1 × 106 T cells for 8–9 h in the presence of 10 μg/ml brefeldin A (Sigma-Aldrich, St. Louis, MO) to block cytokine secretion and 3 μM monensin (Sigma-Aldrich) to prevent TCR internalization. T-enriched cells were also stimulated with 30 ng/ml PMA (Sigma-Aldrich) and 1 μM ionomycin (Sigma-Aldrich) for 8–9 h. Following stimulation, cells were blocked with anti-CD16/CD32 and stained with anti-CD3ε-PerCP-Cy5.5 and allophycocyanin-conjugated CD1 tetramer for 1.5 h at 4°C. After washing out excess reagents, cells were fixed and permeabilized with Cytofix/Cytoperm (BD PharMingen) and stained with anti-IFN-γ-PE (XMG1.2). Thymocytes and splenocytes of individual, littermate or age-matched (6–10 wk of age) mice were stained for four- and six-color flow-cytometric analyses with Abs and reagents as indicated in the figures. Four- and six-color flow cytometry were performed with FACSCalibur (BD Biosciences, San Diego, CA) and LSR-II (BD Biosciences), respectively, as described (2). Data were analyzed with FlowJo software (Tree Star, Ashland, OR). iNKT cell magnetic sorting and phenotypic analysis was performed as described (2). We (2) and others (4) demonstrated recently that inhibition of NF-κB signaling either by T cell-specific IκBαΔNtg (ΔNtg), a dominant-negative form of IκBα, or targeted disruption of NF-κB1 severely perturbs iNKT cell development. In principle, this phenotype could be due to impaired CD1d1 expression or function. Therefore, we measured CD1d1 expression level and functional status on C57BL/6, NF-κB10/0, and ΔNtg CD4+8+ double-positive thymocytes. The data revealed that CD1d1 expression is maintained independent of NF-κB signaling. Furthermore, ΔNtg thymocytes are recognized by iNKT cell hybridomas, excluding a role for NF-κB in the expression of natural iNKT cell Ag (data not shown). Although single-subunit deficiency of NF-κB in NF-κB10/0 mice impairs iNKT cell ontogeny (2, 4), ∼30% of wild-type cell numbers are detected in the spleen (2). It is possible that the remaining NF-κB10/0 iNKT cells could respond to Ag by signaling through other NF-κB subunits (e.g., RelA and cRel). Therefore, we measured the in vivo cytokine response in C57BL/6 and NF-κB10/0 mice using supraoptimal dose of the glycolipid Ag αGalCer to drive cytokine production (11). NF-κB10/0 mice produced very little, if any, IL-2, IL-4, or IFN-γ in response to αGalCer compared with wild-type iNKT cells (Fig. 1⇓A). NF-κB is essential for iNKT cell function. A, C57BL/6, B6.129-NF-κB10/0, and B6.129-CD1d10/0 mice were administered 10 μg of αGalCer or vehicle i.p. Four hours later, serum IL-2, IL-4, or IFN-γ was determined by ELISA. B, BALB/C, C-ΔNtg, C-ΔNtg;Bcl-xLtg, and C.129-CD1d10/0 iNKT cell function was determined as described above. C, MHC class II-positive leukocyte-depleted C57BL/6, B6.129-NF-κB10/0, and B6.129-PKCθ0/0 splenocytes were stimulated in vitro for 8–9 h with either αGalCer-pulsed CD11c+ DC magnetically purified from C57BL/6 splenocytes or PMA and ionomycin in the presence of brefeldin A (BFA) to block cytokine secretion and monensin to prevent TCR internalization. Intracellular IFN-γ in iNKT and T cells were detected following electronic gating (top row) of CD3ε+CD1 tetramer+ cells (middle three rows) and CD3ε+CD1 tetramer− cells (bottom row), respectively. Numbers within plots indicate percentage of total T cells expressing intracellular IFN-γ. D, In vitro activation of BALB/c, C-ΔNtg, and C-ΔNtg;Bcl-xLtg iNKT and T cells was monitored as in C; also see panel for description. Data are representative of three similar experiments. The reduced numbers of NF-κB10/0 iNKT cells and the need for low-level tonic stimulation of dendritic cells (DC) to adequately up-regulate costimulatory molecules, may have caused poor in vivo iNKT cell activation by αGalCer. Therefore, MHC class II-positive leukocyte-depleted splenocytes, which are T cell-enriched, were stimulated in vitro for 8–9 h with CD11c+ DC magnetically purified from C57BL/6 splenocytes and pulsed with αGalCer. As a control, T cell-enriched splenocytes were stimulated with PMA and ionomycin to bypass TCR-based signals. Intracellular IFN-γ within activated iNKT cells and conventional T lymphocytes was monitored. As expected from the in vivo functional studies, αGalCer does not activate NF-κB10/0 iNKT cells in vitro, whereas PMA and ionomycin did (Fig. 1⇑C). Thus, NF-κB1, in addition to its role in development, controls iNKT cell response to Ag in vivo. Although the few remaining NF-κB10/0 iNKT cells appear dysfunctional, and CD1d1 in NF-κB10/0 mice adequately presents the self Ag (data not shown), NF-κB signals may control other properties of APCs that regulate iNKT cell activation. NF-κB signaling in C-ΔNtg mice is impaired only within the T cell lineage, and we have previously shown that Bcl-xL fully rescues iNKT cell numbers in NF-κB signaling-deficient mice (2). Therefore, C-ΔNtg;Bcl-xLtg mice represent an excellent model to study the cell-intrinsic role of NF-κB in iNKT cell function. We administered αGalCer to BALB/c, C-ΔNtg, C-ΔNtg;Bcl-xLtg, and C.129-CD1d10/0 mice and measured IL-2, IL-4, and IFN-γ levels 4 h later. The results revealed that, despite the rescue of iNKT cells to normal numbers in C-ΔNtg;Bcl-xLtg mice, in vivo cytokine response to αGalCer remained negligible (Fig. 1⇑B). Similarly, αGalCer did not activate C-ΔNtg and C-ΔNtg;Bcl-xLtg iNKT cells in vitro (Fig. 1⇑D). Thus, NF-κB signaling to a downstream target(s) other than Bcl-xL is required for mature iNKT cell function. Because TCR-induced NF-κB signaling in mature conventional T lymphocytes is controlled by PKCθ (7, 12, 13), we hypothesized that induction of NF-κB during iNKT cell activation in response to Ag in vivo is mediated by PKCθ. To test this hypothesis, we first determined whether iNKT cells develop in PKCθ0/0 mice. PKCθ0/0 thymus and spleen contain less than one-third the number of iNKT cells compared with PKCθ+/0 thymus and spleen (Fig. 2⇓, A and B). Phenotypic analysis of PKCθ0/0 thymic iNKT cells revealed the presence of previously defined (14) immature (DX5−NK1.1− and DX5+NK1.1−) and mature (DX5+NK1.1+ and DX5−NK1.1+) cells, but their ratio was skewed, in that there were more immature PKCθ0/0 iNKT cells (Fig. 2⇓C). Furthermore, phenotypic analysis using iNKT cell differentiation markers (CD69, CD44, Ly49C/I, CD122, Bcl-2, Ki67, Cyclin D1) confirmed that, despite their reduced numbers, ∼50% of the remaining mature PKCθ0/0 iNKT cells appear to resemble wild-type mature iNKT cells (Fig. 2⇓C). PKCθ is essential for the development of functional iNKT cells. A, Prevalence of thymic and splenic iNKT cells in B6.129-PKCθ+/0 and B6.129-PKCθ0/0 mice were determined as follows. Leukocytes were reacted with CD1 tetramer-allophycocyanin, anti-CD8α-FITC (thymus), anti-B220-FITC (spleen), and anti-CD3ε-PerCP-Cy5.5 Abs and examined by flow cytometry. Contour plots reveal iNKT cells (CD1 tetramer+CD3ε+) within electronically gated CD8LO thymic and B220LO splenic lymphocytes. Numbers within plots indicate percentage of iNKT cells among total lymphocytes. B, Absolute numbers of iNKT cells in B6.129-PKCθ+/0 (n = 5) and B6.129-PKCθ0/0 (n = 5) mice were calculated from total splenocyte number and percentages of each population. C, Phenotype of iNKT cells in B6.129-PKCθ+/0 and B6.129-PKCθ0/0 thymi magnetically depleted of CD8high cells was determined by six-color flow cytometry. At least one million events were collected. iNKT cells were identified as CD1 tetramer+ and CD3ε-PerCP-Cy5.5+ cells. Their phenotype was investigated with anti-NK1.1-PE-Cy7, anti-DX5-PE, anti-CD69-FITC, anti-CD44-PE, anti-Ly49C/I-FITC, and anti-CD122-PE. Intracellular Bcl-2 levels were evaluated by intracellular staining with anti-Bcl-2-PE. Intracellular Cyclin D1 and Ki67 levels were evaluated by staining with anti-Cyclin D1-FITC, anti-Ki67-PE, and IgG2a-isotype control-FITC. D, The functional status of CD1d1 expressed by B6.129-PKCθ+/0 and B6.129-PKCθ0/0 thymocytes was determined by their ability to activate N37–1H5a, a Va14Ja18 iNKT hybridoma in a stimulator-responder coculture system. Secreted IL-2, an indicator of iNKT cell activation by wild-type and mutant thymocytes, was monitored by ELISA. E, B6.129-PKCθ+/0 and B6.129-PKCθ0/0 mice were administered 10 μg of αGalCer or vehicle i.p. Four hours later, serum cytokine levels were determined by ELISA as in Fig. 1⇑A. Data are representative of three similar experiments. iNKT cell development in PKCθ0/0 mice may be disrupted due to impaired CD1d1 expression or Ag presentation in the thymus. However, we found that, akin to PKCθ+/0 thymocytes, those from PKCθ0/0 mice present iNKT cell Ag to iNKT hybridomas (Fig. 2⇑D). Despite expression of functional CD1d1 molecules, PKCθ0/0 mice do not respond to αGalCer in vivo (Fig. 2⇑E) or in vitro (Fig. 1⇑C). Thus, unlike conventional T cells, which do not require PKCθ for their development and maturation, both the ontogeny and function of iNKT cells require PKCθ. In summary, the function of iNKT cells critically depends on NF-κB signaling in a manner distinct from Bcl-xL induction. Furthermore, the ontogeny of functional iNKT cells depends on signals emanating from PKCθ, which is known to be tightly linked to TCR signaling. Together, these findings establish a novel role for NF-κB in lymphocyte development and function. Recent findings from several laboratories (3, 4) including ours (2) have indicated that the ontogeny of iNKT cells is critically dependent upon intact NF-κB signaling in a lineage-specific manner, because conventional T lymphocyte ontogeny proceeds relatively normally (6, 15). Because NF-κB1 deficiency accounts for only a part of the ΔNtg phenotype, other members of the NF-κB family must also be involved in iNKT cell ontogeny. Because the effects of RelB are cell extrinsic, and NF-κB2 deficiency only mildly impairs iNKT cell ontogeny (3, 4), RelA signaling may have a partial, nonredundant role in iNKT cell development. These findings notwithstanding, NF-κB1-deficient iNKT cells do not respond to in vivo stimulation with αGalCer, and produce only small amounts of IFN-γ upon in vitro stimulation. Thus, the ontogeny of functional iNKT cells requires signal processing by NF-κB1. Furthermore, the role of NF-κB1 in signaling iNKT cell ontogeny and function is unique to this lymphocyte lineage, because NF-κB1 deficiency only mildly, if at all, affects conventional T cell biology (16). If the only role of NF-κB in iNKT cell ontogeny is to suppress apoptosis, it would be predicted that C-ΔNtg;Bcl-xLtg mice, which have a normal complement of iNKT cells (2), would rapidly and robustly respond to administered glycolipid Ag. However, αGalCer did not activate C-ΔNtg;Bcl-xLtg iNKT cells in vivo or in vitro. In conventional CD4+ ΔNtg T lymphocytes, in vitro and in vivo TCR stimulation in conjunction with costimulation elicit IL-2 and IL-4 responses (17, 18). Hence, the functional deficiency of NF-κB signaling-deficient iNKT cells is less likely due to defective IL-2 and IL-4 gene regulation. Thus, NF-κB signaling is critical for both the ontogeny and function of iNKT cells. TCR engagement activates PKC isoforms, which relay signals to downstream effectors. PKCθ plays a critical role in mature, conventional T cell activation, but does not affect β-selection or positive and negative selection (7, 13). In striking contrast, we found that PKCθ deficiency severely impairs thymic iNKT cell ontogeny, suggesting the coupling of Va14Ja18 iNKT cell receptor engagement to NF-κB signaling in the thymus. Thymic iNKT cell deficiency in PKCθ0/0 mice is less severe compared with ΔNtg mice but similar to that found in NF-κB10/0 mice, suggesting a partially redundant role with another PKC isoform, possibly PKCε, because PKCε appears to play a critical role in conventional T cell ontogeny (19). These findings imply unique signaling events in the ontogeny of functional iNKT cells. 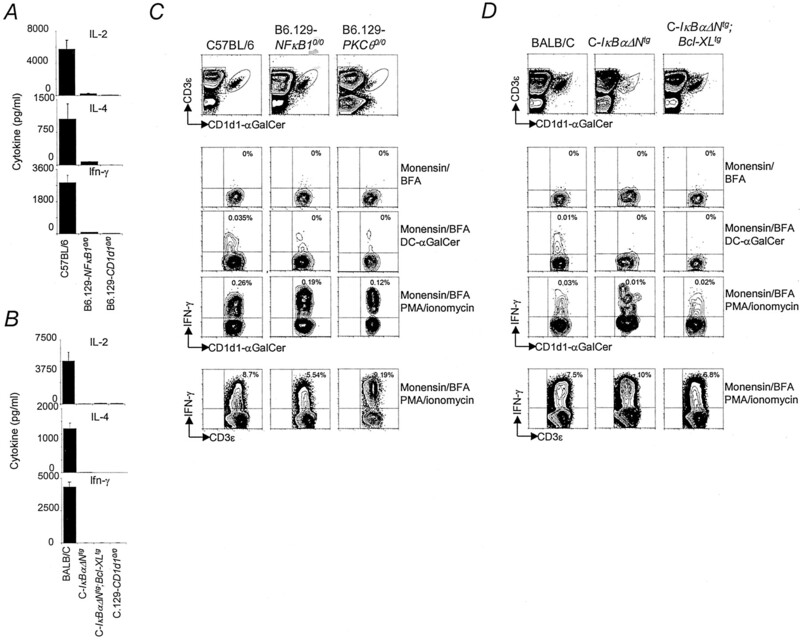 Furthermore, the critical requirement for PKCθ in iNKT cell ontogeny suggests unique organization of the Va14Ja18 TCR and proximal signaling apparatus essential to the development of this T lymphocyte lineage. This conclusion is consistent with our recent results from biochemical studies of glycolipid Ag-TCR interactions (11). Under certain circumstances, activation of iNKT cells is pathogenic (20, 21, 22, 23, 24). The preferential requirement for NF-κB signaling in iNKT cell ontogeny and function may explain why Th2 responses evolve in ΔNtg mice, but fail to induce airway hyperreactivity (17). Thus, our findings suggest that short-term therapeutic inhibition of NF-κB signaling has substantial clinical potential. We thank Kirin Brewery for synthetic αGalCer, D. R. Littman for B6-129-PKCθ0/0 mice, K. Hayakawa for iNKT hybridomas, W. Khan for PMA and ionomycin, A. J. Joyce for technical assistance, M. H. McReynolds for ΔNtg mouse genotyping, and W. Briley and M. Henderson for secretarial assistance. ↵1 This work was supported by National Institutes of Health (HL68744, AI50953, NS44044, HL61752, AI49460, and AI42284), Juvenile Diabetes Research Foundation, Human Frontiers in Science Program, and Sandler Family Foundation grants. ↵3 Abbreviations used in this paper: iNKT, invariant natural T; αGalCer, α-galactosylceramide; PKC, protein kinase C; DC, dendritic cell. Stanic, A. K., J. S. Bezbradica, J.-J. Park, N. Matsuki, A. L. Mora, L. Van Kaer, M. R. Boothby, S. Joyce. 2004. NF-κB controls cell fate specification, survival and molecular differentiation of immunoregulatory natural T lymphocytes. J. Immunol. 172:2265. Sun, Z., C. W. Arendt, W. Ellmeier, E. M. Schaeffer, M. J. Sunshine, L. Gandhi, J. Annes, D. Petrzilka, A. Kupfer, P. L. Schwartzberg, D. R. Littman. 2000. PKC-θ is required for TCR-induced NF-κB activation in mature but not immature T lymphocytes. Nature 404:402. Gui, M., J. Li, L. J. Wen, R. R. Hardy, K. Hayakawa. 2001. TCRβ chain influences but does not solely control autoreactivity of Vα14Jα281 T cells. J. Immunol. 167:6239. Stanic, A. K., R. Shashidharamurthy, J. S. Bezbradica, N. Matsuki, Y. Yoshimura, S. Miyake, E. Y. Choi, T. D. Schell, L. Van Kaer, S. S. Tevethia, et al 2003. Another view of T cell antigen recognition: cooperative engagement of glycolipid antigens by Va14Ja18 natural T (iNKT) cell receptor. J. Immunol. 171:4539. Arendt, C. W., B. Albrecht, T. J. Soos, D. R. Littman. 2002. Protein kinase Cθ: signaling from the center of the T-cell synapse. Curr. Opin. Immunol. 14:323. Coudronniere, N., M. Villalba, N. Englund, A. Altman. 2000. NF-κB activation induced by T cell receptor/CD28 costimulation is mediated by protein kinase Cθ. Proc. Natl. Acad. Sci. USA 97:3394. Corn, R. A., M. A. Aronica, F. Zhang, Y. Tong, S. A. Stanley, S. R. Kim, L. Stephenson, B. Enerson, S. McCarthy, A. Mora, M. Boothby. 2003. T cell-intrinsic requirement for NF-κB induction in postdifferentiation IFN-γ production and clonal expansion in a Th1 response. J. Immunol. 171:1816. Simon, A. K., N. Auphan, M. Pophillat, C. Boyer, S. Ghosh, M. Rincon, R. A. Flavell, A. M. Schmitt-Verhulst. 2000. The lack of NF-κB transactivation and PKCε expression in CD4+CD8+ thymocytes correlates with negative selection. Cell Death Differ. 7:1253. Heller, F., I. J. Fuss, E. E. Nieuwenhuis, R. S. Blumberg, W. Strober. 2002. Oxazolone colitis, a Th2 colitis model resembling ulcerative colitis, is mediated by IL-13-producing NK-T cells. Immunity 17:629.